Methane, a potent greenhouse gas, accumulates in subsurface hydrocarbon reservoirs, such as coal beds and natural gas deposits. In the Arctic, permafrost and glaciers form a ‘cryosphere cap’ that traps gas leaking from these reservoirs, restricting flow to the atmosphere. 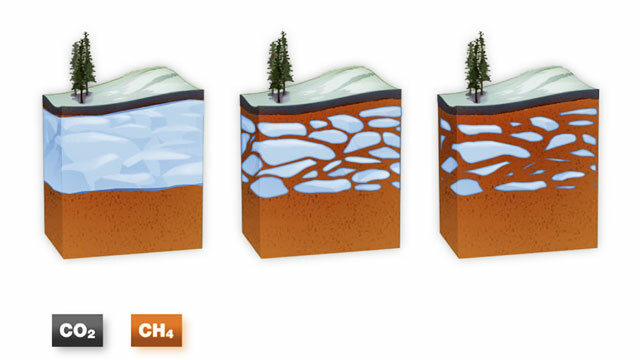 With a carbon store of over 1,200 Pg, the Arctic geologic methane reservoir is large when compared with the global atmospheric methane pool of around 5 Pg. As such, the Earth’s climate is sensitive to the escape of even a small fraction of this methane. Here, we document the release of 14C-depleted methane to the atmosphere from abundant gas seeps concentrated along boundaries of permafrost thaw and receding glaciers in Alaska and Greenland, using aerial and ground surface survey data and in situ measurements of methane isotopes and flux. We mapped over 150,000 seeps, which we identified as bubble-induced open holes in lake ice. These seeps were characterized by anomalously high methane fluxes, and in Alaska by ancient radiocarbon ages and stable isotope values that matched those of coal bed and thermogenic methane accumulations. Younger seeps in Greenland were associated with zones of ice-sheet retreat since the Little Ice Age. Our findings imply that in a warming climate, disintegration of permafrost, glaciers and parts of the polar ice sheets could facilitate the transient expulsion of 14C-depleted methane trapped by the cryosphere cap.